If you’re a small business, compiling an employee handbook can seem like a rather fruitless task. Surely you can verbally communicate your company policies and ethos with your staff, and isn’t it a costly exercise? The answer is not always. 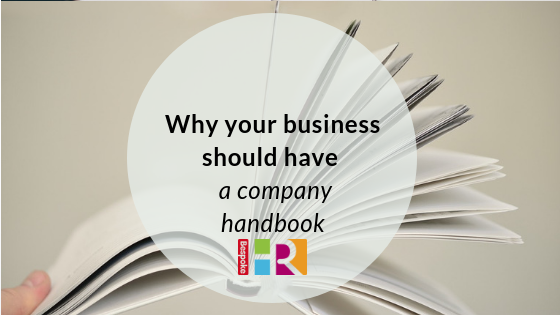 Whilst it’s not a legal requirement, an employee handbook not only informs your staff of their legal rights, but more importantly, helps to protect your business. This is essential for new employees and a great way to introduce them to your business. Handbooks can be used to set out your company vision and values, and get buy-in from new starters from the outset. Not only will it give staff a clear understanding of where the business is heading, but will let them know where they fit, what is expected of them and what isn’t tolerated. Provide a company structure so that new starters can see the management structure and understand who they report into. By setting out your company rules from the outset, this should eliminate confusion further down the line and help avoid potential HR issues. The staff handbook is also a good place to detail your company benefits and add-ons you may offer staff, such as flexible benefits schemes or bonuses. If your business should face a legal claim from an employee, your employee handbook will serve as a useful document in your defence. It will demonstrate that your business had policies and procedures in place at the time of the claim. Make sure you keep your handbook up to date and in line with changes in employment law. If you need help with handbooks or would like a HR health check, get in touch to see how we can help.